Paul Elsass started writing in 1986. He has written articles for the Clinical Exercise Physiology Association and multiple medical-fitness centers. Elsass has certifications through the American College of Sports Medicine and the American Council on Exercise. He holds a Bachelor of Science in Kinesiology from the University of Texas and a Master of Science in Management from Northern Arizona University. The Body Ecology Diet, or BED, was created by Donna Gates as she sought to cure her own chronic battle with candida. She maintains that following the BED will strengthen your organs and immunity by starving the yeast and restoring normal flora. The diet includes seven basic principles which address not only what to eat, but also how and when to eat certain foods. 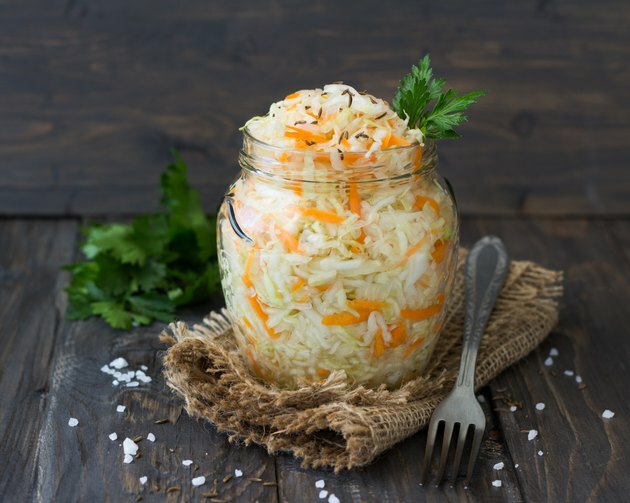 Cultured and fermented foods are highly encouraged. Most land vegetables are allowed on the BED, especially if they are cultured, or fermented. There are a few land vegetables which are excluded on the diet for various reasons. Vegetables high in natural sugars, including parsnips, wheat grass grown indoors, russet and sweet potatoes are prohibited. Beets are only allowed if fermented. Members of the nightshade family, including tomatoes, eggplants and bell peppers are not to be eaten on the BED. The only mushroom allowed is shitake. Donna Gates cautions against mung bean sprouts, which she says often contain mold. Mineral-rich ocean vegetables are encouraged on the diet. Several common varieties include dulse, kelp, nori and wakame. Herbs and sea salt are encouraged, and herbs to use especially liberally include cayenne, ginger, garlic and curry. Soaked and sprouted almonds are the only nuts included in the Body Ecology Diet, and then only if they do not cause you digestive problems. Sunflower, pumpkin and flax are the seeds included on BED, and soaking and sprouting is recommended with the seeds also for better digestibility. Four grains are allowed on the diet, and all are gluten-free. They should only comprise 20 percent of a given meal and include quinoa, buckwheat, amaranth and millet. Corn is allowed in milder cases or after some healing has already occurred. As with nuts and seeds, grains should be soaked prior to eating on this diet. Stevia is the only approved sweetener on the Body Ecology Diet, and Donna Gates has even co-authored a stevia cookbook. All fats and oils used on the diet must be unrefined and should be organic if possible. Coconut oil, ghee and butter are used in cooking, while seed oils are better suited to uncooked foods such as salad dressings. Allowable seed oils are safflower, sunflower, pumpkin seed, hemp, evening primrose, borage and flax. At first, the only permitted fruits are lemons, limes, cranberries and black currants. Strong caution is given not to move to sweeter fruits until candida symptoms are gone, which could take a year or more. The first fruits you should try at that point should be sour rather than sweeter varieties. Examples include kiwi and grapefruit. When animal products are consumed on the Body Ecology Diet, they should comprise no more than 20 percent of any given meal and should always be eaten with cultured vegetables. Organic meat is allowed in moderation, and fish is preferred over other meats. Eggs are encouraged, but advice is given in the book on how and when to consume them based on your lifestyle. The only dairy products that are allowed on the BED are kefir and yogurt with no added sugar or other prohibited ingredients. Which Nuts Are Allowed on the Candida Diet? What Kind of Fruits Are in the Candida Diet? Which Foods Are on the 7th Day Adventist Diet? What Is a Kosher Diet?